You want to keep the surface wet at all times. If you don't want to purchase a huge quantity be sure to shake the tank every few minutes for an hour or so and the tank should be clean by then. You can also dilute the phosphate and it will work fine, just slower. Nessism wrote: You want to keep the surface wet at all times. If you don't want to purchase a huge quantity be sure to shake the tank every few minutes for an hour or so and the tank should be clean by then. You can also dilute the phosphate and it will work fine, just slower. Just to avoid I misunderstand something, can I just fill the tank completely full and let it stay for 1 hour ? Or do only want to have the surface wett, so 2 liter is a good number ? I`m planning to use hot water with the acid, then the effect increase ? dilute the acid with water will extended the time. 2 liter acid is good and let the tank swim into your bathtub filled with hot water, shake and turn the tank every few minutes for an hour. The acid has a concentration 70%, need to use som water to get it down to 30%, was planning to use hot water todo that ? 30% is the strongest I'd go. Hot water to dilute is good. I don't know exactly how long it will take to remove the rust but I suspect less than one hour. Nessism wrote: 30% is the strongest I'd go. Hot water to dilute is good. I don't know exactly how long it will take to remove the rust but I suspect less than one hour. Today have I used phosphoric acid inside the tank. 1. Degreased the tank inside. 2. Flushed with clean water. 3. Added 30% phosphoric acid and turned the tank around each 3-4 minutes for 40 minutes. 4. Flushed the tank for a good while with fresh water, tried to get all water out. 5. Added Isopropyl alcohol turned the tank around for a while, dropped it off..
6. 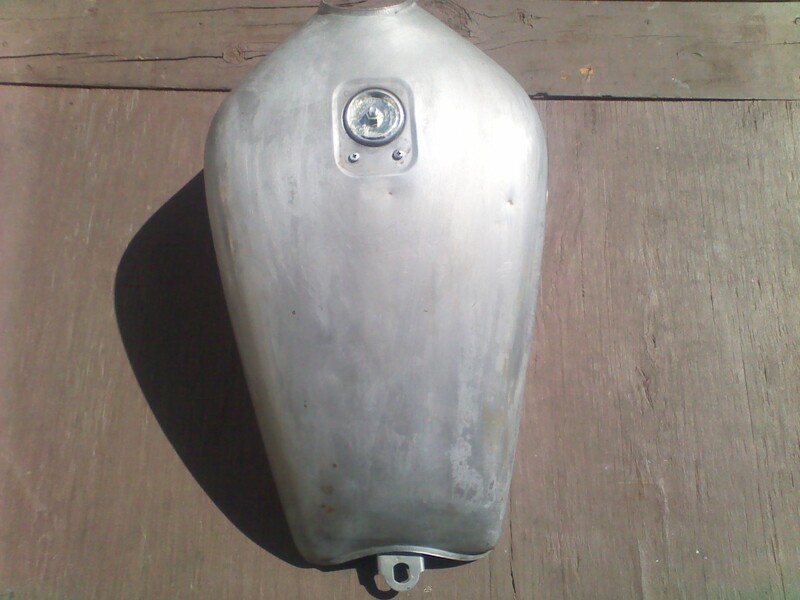 Spayed alot of WD-40 and turned the tank aorund..
7. Used hair draier on the filling whole and let the hot air come out from the level switch and petstock. Is these good enough for a long term condition... ? 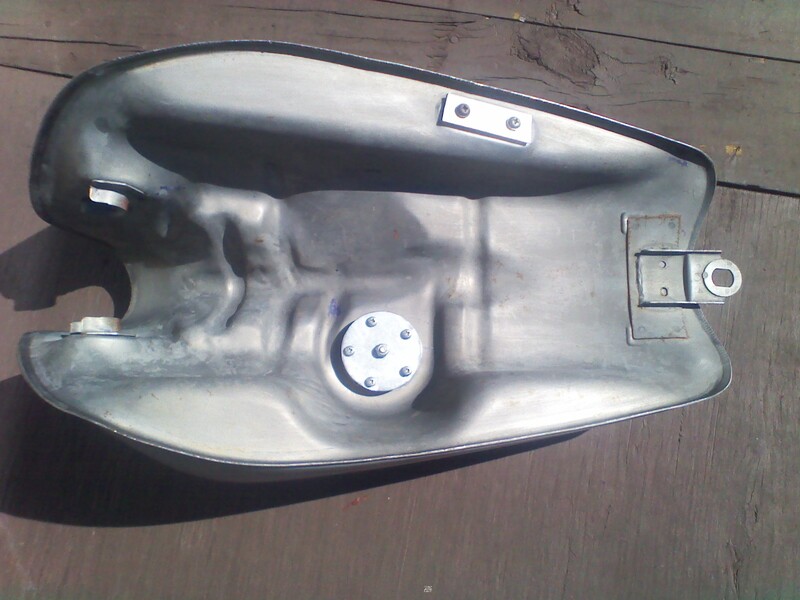 For fuel tank storage. I would consider using Snowmobile Fogging Oil. .... wd40 kind of evaporates. Looks like the tank still needs a little work. A very nice start though. The brown spots are either rust or fuel varnish. I'm not sure which, but it's critical for you to figure what they are because the process for removal is different. For rust you just need a little more time with the phosphate sauce. If they are varnish then you need something like carb cleaner to break through that. I would put some handfull of little nuts or steel marbles with phosphate acid into the tank and shake him like hell to loosen the rust particles. Condition inside the tank, old gas ? corrision? For me it looks like a combination of old gas and corrosion ? I`m afraid I damage the nice painted surface on the outside using nuts and small metals parts to remove the corrosion on the inside? 1. Carb cleaner ? just spray all whole box inside the tank and then what ? must I do some mechncial to remove it ? or can I just turn the tank around same as with the Acid ? 2. Flush the tank with clean water ? 3. Add Acid again, 30% or go higher ? Thank your for your advise ! 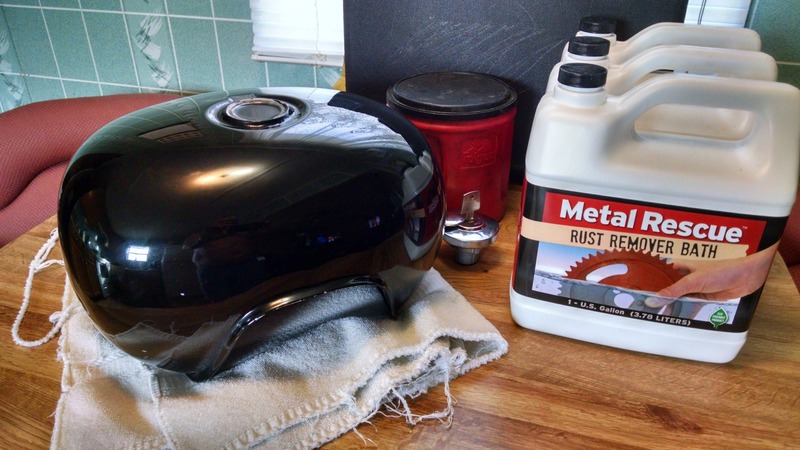 Maybe a stupid question, but what do I gain by getting the metal 100% clean from corrosion and old gas ? Will the corrosion of the metal go slower and the tank will be fine for longer period ? After I installed a inline fuel filter has the big gone smooth for a season. Thank you all for your advise and input ! Nessism wrote: Looks like the tank still needs a little work. A very nice start though. The brown spots are either rust or fuel varnish. I'm not sure which, but it's critical for you to figure what they are because the process for removal is different. For rust you just need a little more time with the phosphate sauce. If they are varnish then you need something like carb cleaner to break through that. Thank you, me plan is try both carb cleaner and acid. Carb cleaner, will purchase two boxes today, and just spray all inside the thank, can I just roll the tank around? Not need mechnical clean it with a brush or something? Don’t know how to get access? After just flush with water? Acid, shall I just go for 30% mix these time or higher? For how long time? Just investigate with camera under the process? I've enjoyed very good success by putting some links of various size chain and sheet metal screws and other miscellaneous ferrous nuts and bolts inside a dry tank, wrapping the tank with cushions/pillows/beach towels/whatever to protect the tank's exterior finish, and then tumbling the cushioned tank inside a clothes dryer on no-heat for an hour or so - repeat as needed - to obtain a smooth rust/crud-free interior. It's easy, safe and not messy. And far more efficient than struggling to shake the tank by hand (if wanting to attempt that for a few hours - ouch! ). Anyone who has polished stones by tumbling can relate to this method. 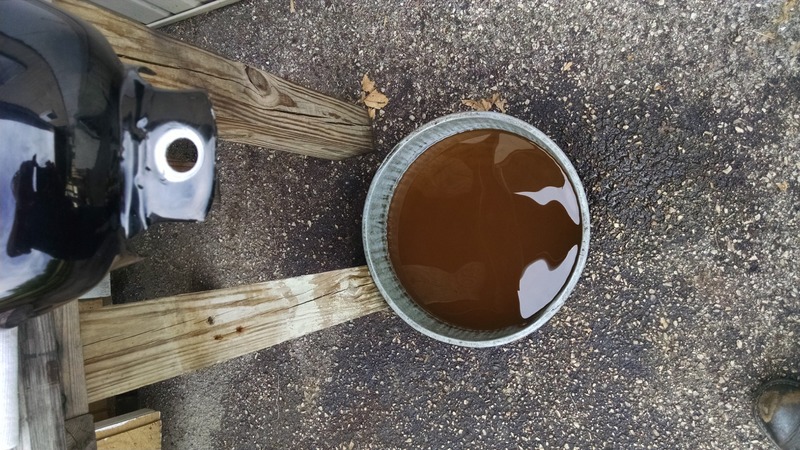 When finished tumbling, can rinse with water, then rinse again with common household rubbing alcohol, allow to dry (may use a hair dryer), and immediately spray/coat interior with WD40 or marine oil fog to protect until filling with fresh gasoline. Patton wrote: I've enjoyed very good success by putting some links of various size chain and sheet metal screws and other miscellaneous ferrous nuts and bolts inside a dry tank, wrapping the tank with cushions/pillows/beach towels/whatever to protect the tank's exterior finish, and then tumbling the cushioned tank inside a clothes dryer on no-heat for an hour or so - repeat as needed - to obtain a smooth rust/crud-free interior. Will try the plan above tomorrow. Your plan will work. Just look inside the tank to judge progress and stop when all the spots are gone. My guess on the time is a few hours. I've done the dryer tumble on several motorcycle tanks. I found an expanding rubber plug that fits my tank openings perfectly, and make up block off plates for all of the sensors and petcock. My old Kaw had a "kreme job" when I got it, and not a nice one either, (if there is such a thing). I first tumbled it in my dryer with a gallon of MEK and 50 drywall screws in it for half an hour, then I turned it around 180* then rotated it another half an hour to hit the "other side" inside the tank to remove that nasty white crap. (aka liquid death) I wrapped it in a puffy sleeping bag, then packed pillows around it so that it could not move inside my dryer, allowing it to beat a bunch of dents in it. Definitely remove all of the senders and petcock etc. Yesterday I had a new session se to remove the corrosion completely. 1. Decreased the tank and flushed it a lot with clean water. 2. Sprayed a whole box of carb cleaner in the tank and roller the tank around for a while. 3. Flushed the tank with clean water. 4. Added 2,5l with Acid around 30%. 5. Turned the tank around time to time for approx. 1 hour, checked the tank and it was really good some left only. 6. Turned the tank around for approx. 1 hour more, an the tank was even cleaner, now it was only corrosion where the plate end, where they meet each other in the front of the tank, please see picture below..
8. Flushed the tank with hot clean water and then cold clean water..
9. took out all water and added Isopropanol, and dumped it out again..
10. sprayed 2 boxes of WD-40 and turned it around. Here can you see the last corrosion who is left I think? Looks good. Maybe that spot is not corrosion? Chunk of varnish? Can you reach into the tank with a bent rod or something and try scraping at it?